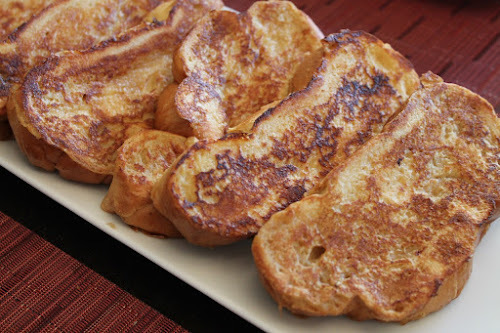 There are a lot of ways to make French toast. 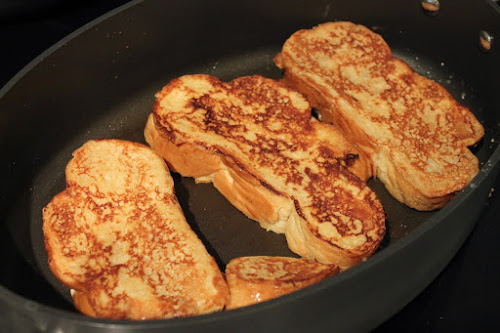 The simplest, which I remember my mom doing when I was a kid, is to whisk egg and milk together, dip sandwich bread into it, and grill the bread in a pan. From there, you can get all kinds of elaborate. Personally, I find the recipes that call for a lot of eggs, sugar and cream to be too rich. That approach results in what's basically an egg custard held together with bread. I'm also not a fan of deep-frying French toast. It's just too much. My approach below is adapted from America's Test Kitchen's recipe. For years, I made their recipe faithfully, although recently I've been changing it up a bit. I wanted a little more egg (they use only one), a little less flour, and cinnamon, which goes nicely with the vanilla and is just classic in my book. Although you can use any bread, challah bread works nicely. The sugar in this gives bread just a hint of crunch. I don't call for soaking the bread a long time--just briefly. I don't want a really dense French toast (plus, you'll probably use your batter up too fast with a long soak). 2. In a large shallow bowl, whisk together the eggs, milk, butter and vanilla. In a small bowl, whisk together the sugar, flour, salt and cinnamon. Whisk the dry ingredients into the wet ingredients to create a uniform batter. 3. Add half the unmelted butter to the hot skillet. Dip three pieces of bread (one at a time) into the batter, allow it to soak for a few seconds and wiping off any excess batter with your fingers. Place the dipped bread in the skillet and cook until lightly browned, about 2-3 minutes. Turn over and cook another minute to 90 seconds. Set aside on a platter, add the remaining butter to the skillet and repeat with the other three pieces of bread (this should use up almost all the batter). 4. Serve French toast with warm maple syrup. Another year comes to a close at the end of the week. Like other recent years, it was a very busy time for new restaurants in D.C. (Eater D.C. counted 102 openings in the fall alone). I made an effort to get to many of the ones I thought sounded most interesting, but of course, there were still quite a few I haven't visited yet. I also like to mix in older restaurants which, after all, can do new and interesting things all the time, even if they've been open for years. It wasn't a big year for me travel-wise, and I found myself less interested in writing about the places we visited while away from home. I really meant to do a round-up of places we ate in Southern California, but just didn't get around to it. So, I'll make up for that right now, briefly, by sharing the highlights: 1) Norah in West Hollywood is fabulous--delicious food, good service and an inviting space, 2) Breakfast in L.A.'s retro diners is the best way to start the day with a Southern-California frame of mind (Mel's Drive-In and NORMS in West Hollywood were both good, and the old-Hollywood charm of Fred 62 is perfect before a morning hike in Griffith Park), 3) The Good Lion cocktail bar in Santa Barbara has a very friendly staff shaking/stirring some really excellent drinks, and 4) I didn't expect much from Long Beach, but was pleasantly surprised by great whiskey-focused bar, The Blind Donkey. Best Starter/Small Dish: Leeks Dijonnaise, Convivial. It's easy to turn leeks into soup; harder to serve them in larger form without ending up with a squishy, stringy texture. Convivial treats the allum just right in this delicious, nicely textured opener. 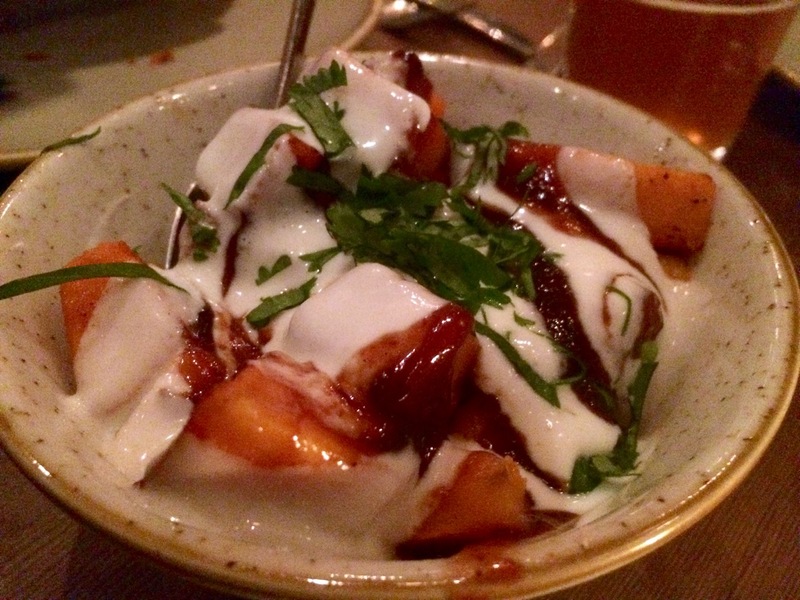 Runners up: wood-grilled carrots with yogurt at Buck's Fishing and Camping, bhel puri (puffed rice, fruit, and mint grain salad) at Bindaas. Best Pasta: Sfoglina. 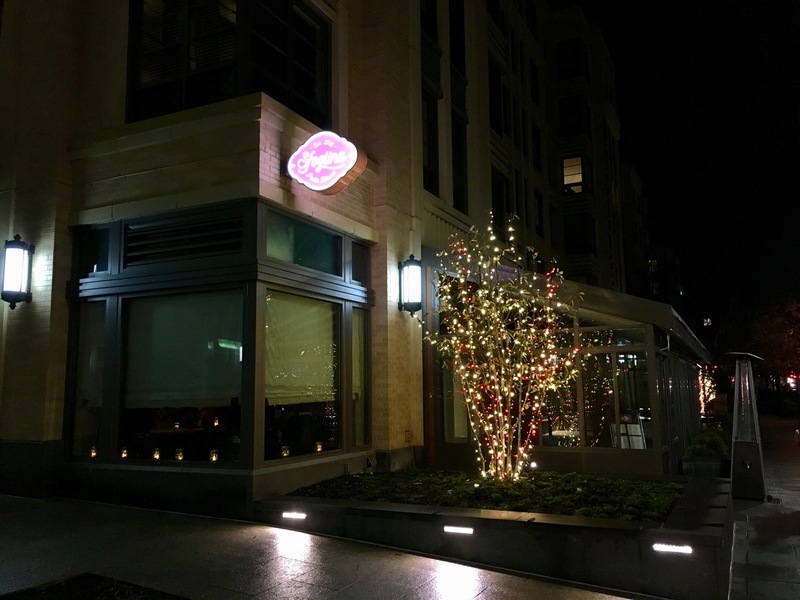 The just-opened fourth D.C. restaurant from chef Fabio Trabocchi and his wife Maria has quickly proven itself to be an excellent spot for a top-quality bowl of pasta. Whether you go for a short-rib filled agnolotti or a deeply mushroomy corzetti, you're in for a treat. Runner-up: Corn Ravioli at Tail Up Goat. Best Pizza: All-Purpose. D.C. has been blessed with an abundance of delicious pizza in recent years (see "Survivor of the Year" below for another good one). The opening of All-Purpose this year has really upped the game with its wonderfully flavorful crust and perfectly balanced toppings. Pepperoni pizza hasn't been this exciting since the '80s. Runner up: Farmers and Distillers, which also serves a good pepperoni pizza with whole-grain crust and flavorful red sauce. Best Tacos: Mayahuel (NYC). 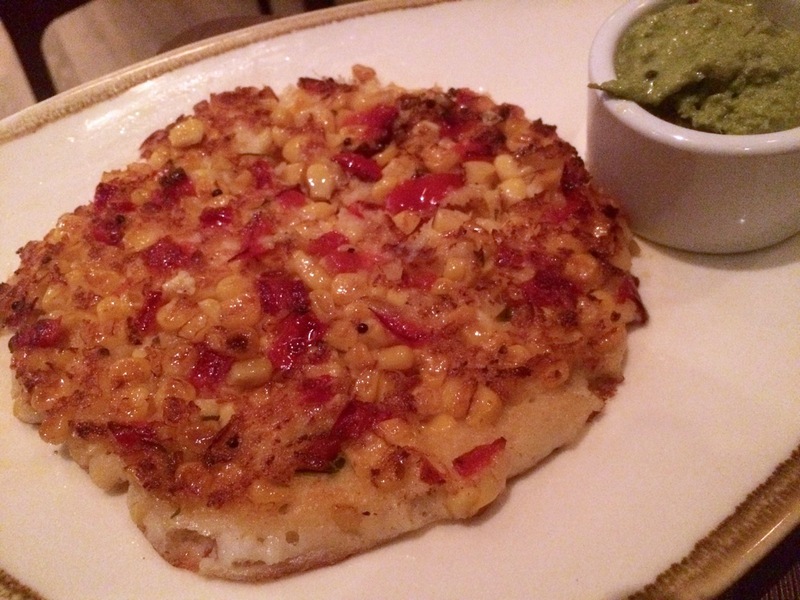 Here's a wonderful secret about New York's top mezcal-loving cocktail bar, Mayahuel: The food is also amazing. While we liked everything we ate at Mayahuel--and the smoky salsa is a particular standout--the spicy, flavorful tacos were just incredible. Can't wait to go back for more. Runners up: Empellón Taqueria (NYC), Espita Mezcaleria. Best Entree (That Isn't One of the Above): Autumn Olive Oil Pork, The Dabney. Perhaps the best pork dish I've ever had, this tender, flavorful dish was a highlight among an evening of standouts. Runner up: Coq au Vin Fried Chicken at Convivial. Best Dessert: Key Lime Pie, Convivial. Tart and sweet achieve perfect balance in Convivial's key lime pie, a dish as beautifully composed as it is tasty, topped smartly with slices of fresh kiwi. 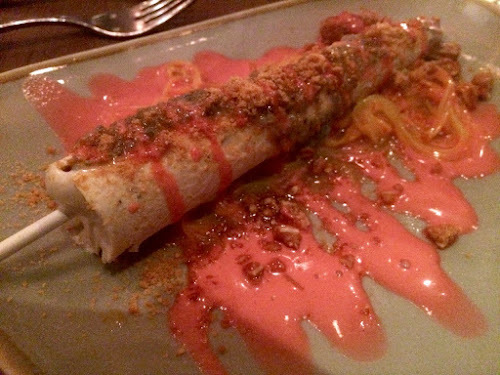 Runners up: Churros with chocolate at Mayahuel (NYC); Sorghum Custard at The Dabney, 15-Layer Carrot Cake at The Source. Best Fast-Casual Newcomer: Shouk. If eating "vegan" is still a turnoff to you, then fine, skip Shouk. That just means I'll have a shorter wait for what has become one of my favorite lunch spots, serving insanely delicious pitas and bowls stuffed with spiced, roasted vegetables. Although I haven't tried it yet, I hear their new burger is a knockout. Best Cocktail: The Six Shooter, Mayahuel (NYC). Mayahuel has many, many good cocktails, as I've written about last year, including the Dijahbone, last year's cocktail of the year. Well, The Six Shooter, a bracing and dark combination of rum, mezcal and quite a few modifiers, may just be the cocktail of the decade. We love this so much, I tried my hand at approximating it. Runners up: Always Betz on Black at The NoMad (NYC), Smiling Rabbit at Espita Mezcaleria. Best Service: Tail Up Goat. 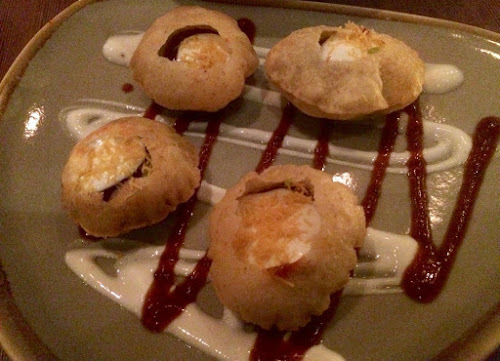 I have a lot of pleasant memories from our dinner at Tail Up Goat, but what I remember most was the excellent service. Despite the very busy Saturday evening we were there, the service from everyone was friendly but not overly so, prompt but not rushed and marked by genuine affection for the food and their work. I can't stand being in a busy restaurant that feels like they want to rush you through to seat the next billing as quickly as possible--I didn't feel that way at all here. Runners up: Mayahuel, The Dabney, All-Purpose. Best Overall Experience: The Dabney. Today we may use microwaves, gas burners and sous vide machines, but cooking started with simple, smoky fire. That The Dabney cooks everything over (or near) a massive open fire pit makes its food kissed with smoke and char in delightful ways that still deliver texture and flavor. The homey decor and friendly service enhance an experience that I look forward to repeating next year. Runners up: Mayahuel (NYC), All-Purpose, Convivial. Restaurant I'm Sorry to See Go: Kangaroo Boxing Club. This delightful Columbia Heights restaurant saved my night this summer after a lousy experience at a nearby bar. They completely turned my evening around with delicious barbecue and friendly service. Sorry to hear it's closing. Also closed this year: Espuma (Rehoboth Beach). Survivor of the Year: Comet Ping-Pong. Consider this an extra-honorable mention for one of our favorite neighborhood hangouts that has weathered with patience and grace unthinkably cruel attacks based on groundless conspiracy nonsense. That the attacks spilled over into the rest of the neighborhood and turned violent hasn't stopped the neighborhood from voicing its support for this and other nearby great establishments. 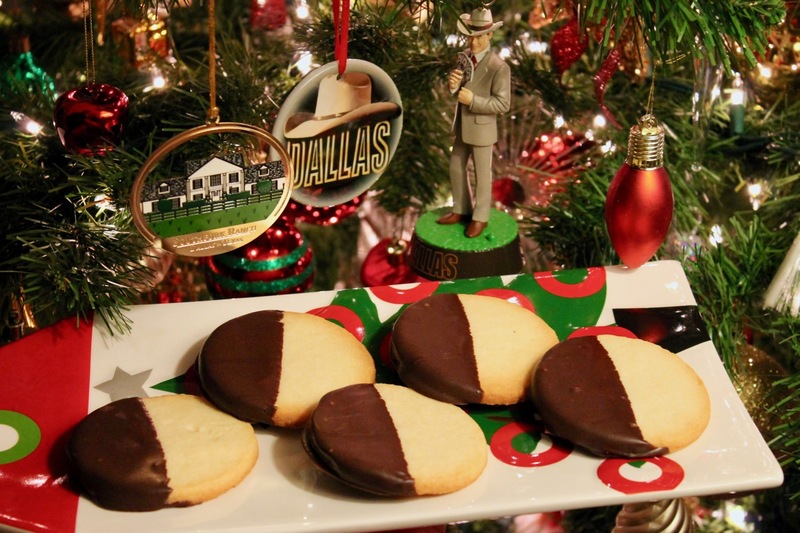 This Year's Dallas Holiday Bakeoff is a contest between the Shepard sisters. 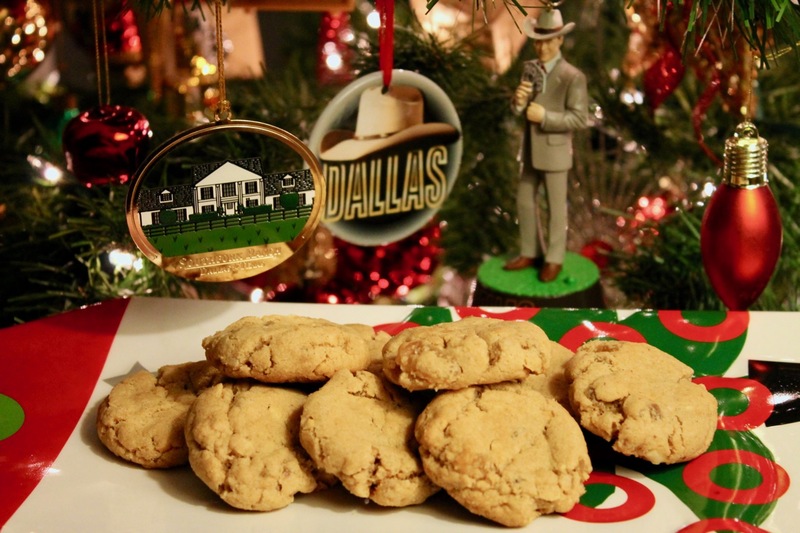 Click here for Sue Ellen's entry. J.R. and Bobby may be the famous sibling rivals on Dallas, but they fundamentally loved each other. I'm not sure you can say that about the shows most famous female sibling rivalry: the eternal contest between Sue Ellen and her younger sister Kristin. Whenever Sue Ellen gets what she wants, Kristin seems to want it too. And if she can't have it? Well, there's a reason "Kristin" is the answer to Dallas's most famous question. Imagine if the Shepard girls' rivalry extended to the kitchen. What would they bake to show up the other? 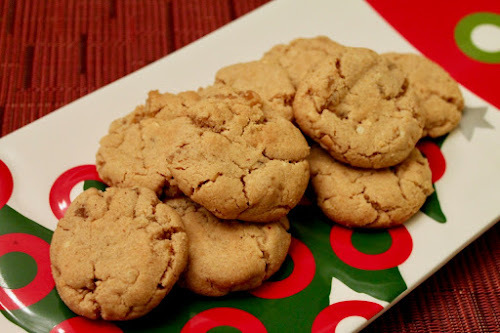 Being the spicier (and generally nuttier) of the two, these zippy Peanut Butter Ginger cookies are perfect for Kristin. Want to up the heat? Add a little cayenne pepper. Don't be shy...Kristin certainly wasn't. Just don't eat these from a balcony overlooking a swimming pool. 2. Line two baking sheets with parchment or silicon liners. In a medium bowl, add the flour, baking soda, baking powder and salt and whisk together. 3. In the bowl of a stand mixer (or alternatively a large bowl if using a hand mixer), combine the butter and sugar and beat on medium-high until creamy, about 5 minutes. Add the sugar and brown sugar and beat until well mixed, then add the egg and vanilla paste (and cayenne pepper, if using) and beat until mixed in. On low speed, add the mixed dried ingredients and the chopped crystallized ginger and beat until the dough is just evenly mixed. 4. Form the dough into 1-inch balls and place on the lined baking sheets about two inches apart. Flatten the balls slightly with the bottom of a glass or a fork (the latter will make fork-grooves). Bake for 9 to 11 minutes until the cookies have spread slightly and are lightly browned around the edges. Remove from the oven, allow to cool about 5 minutes on the baking sheet, then transfer to a cooling rack to cool completely. Store in the refrigerator. This Year's Dallas Holiday Bakeoff is a contest between the Shepard sisters. Click here for Kristin's entry. Kristin may have been the more devious Shepard sister, but Sue Ellen was definitely the classier one. Nobody exudes style like Sue Ellen. Among her many memorable looks, the most iconic was the black and white dress from the fourth season, which she was wearing when she was arrested for shooting J.R. (spoiler: it was really her sister Kristin who did it!). 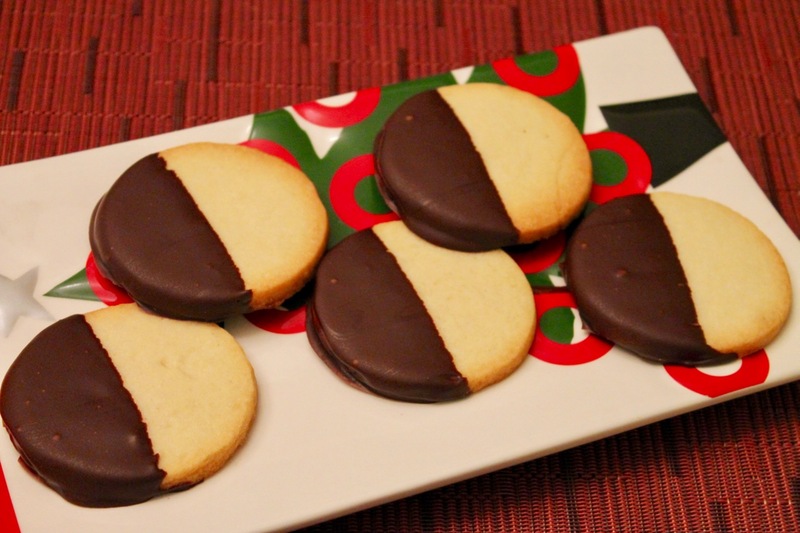 These Black and White Cookies pay homage to that iconic look, a buttery vanilla cookie half-dipped in dark chocolate. They taste as good as they look and would certainly give Sue Ellen the upper hand she needs to best Kristin. 1. Combine butter, sugar and salt in the bowl of a stand mixer (or a large bowl if using a hand mixer). Beat on medium speed until creamy, about 3-5 minutes. Stop the machine and scrape down the sides of the bowl a couple times while mixing. Add the egg whites and vanilla extract and mix on low speed, then add the flour in 3 or 4 additions, mixing on low speed as you add it. Scrape down the bowl as you go to evenly mix the dough. 2. Cut two large sheets of parchment paper and place the dough between the two sheets. Use a rolling pin to roll the dough out to a consistent thickness of about 1/4 inch. Place the dough on a baking sheet and chill in the refrigerator for 3 hours or freeze for 1 hour. 3. Position oven racks in the upper and lower thirds of the oven. Preheat oven to 350 F.
4. Carefully peel away the parchment from the rolled out dough (remove the top parchment first; carefully flip the dough over onto a clean sheet of parchment and then remove the other parchment). 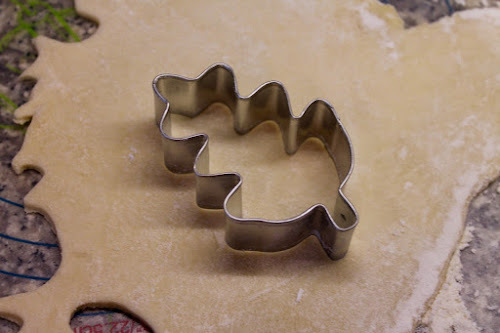 Using a 2 1/2 inch round cookie cutter, cut out cookies and transfer to a baking sheet lined with parchment or silicon, leaving about 1 inch between cookies. Collect dough scraps and re-roll as needed to use as much of the dough as possible. 5. Bake cookies until the edges a lightly golden, about 19 to 21 minutes. Rotate the cookie sheets top-to-bottom halfway through baking. Remove cookies from oven and cool on the baking sheets for 5 minutes, then transfer cookies to a wire rack to cool completely. 6. Chop the chocolate into 1/2 inch pieces. Place a microwave-safe bowl and microwave on high for about 1 minute. Stir the mixture, then microwave on high for 15 to 30 second increments, stirring after each heating, until the chocolate is almost completely melted, then stir the mixture until it is completely melted (the residual heat will melt and remaining chunks; you want to be careful not to over-microwave the chocolate, as it can burn). Stir in the vegetable oil. Transfer the mixture to a contain a tallish container--something that's barely wider than the cookies is ideal, like a coffee mug. Dip each cookie halfway into the melted chocolate, then transfer the cookie to a baking sheet lined with parchment or silicon to dry. Place the cookies in the refrigerator to firm up the chocolate. When I moved to the Van Ness neighborhood 10 years ago, about the best thing people said about its restaurant options was that there were a lot of sandwiches: Subway, Quiznos, Jerry's, Schlotsky's and Potbelly. Otherwise, there was a pretty grim selection of rather mediocre options, including a couple of subpar Chinese restaurants, an Indian restaurant I heard was not good, a combination Taco Bell/KFC and Tesoro, an Italian restaurant catering to the Days Inn guests and Tim Russert that failed to impress us enough to warrant a second visit. Since then, this little enclave of businesses around the University of the District of Columbia has finally started attracting some decent to pretty remarkable places to eat. All of the aforementioned places except Subway, Potbelly and Tesoro are now gone. Today, Van Ness boasts a decent pho outlet, a pretty good Thai restaurant, an attractive restaurant/wine bar, a promising market and a James Beard award-nominated bakery. 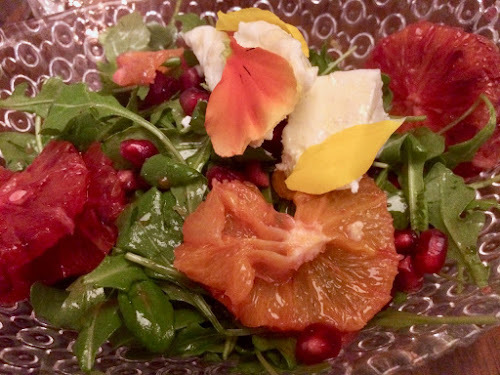 With Sfoglina, Van Ness finally gets a full-service restaurant with A-list credibility. It's the fourth D.C. restaurant from the city's reigning duo of top-quality Italian cuisine: Chef Fabio Trabocchi and his wife/business partner Maria. First came Fiola, the downtown establishment known for its amazing lobster ravioli that recently was awarded a Michelin star, then Casa Luca, another downtown outlet that's more causal and less expensive (but just as tasty), and then Fiola Mare, the seafood-focused restaurant in Georgetown. The Trabocchis' other restaurants have always been known for their pastas, which take center-stage at Sfoglina, which literally means "pasta maker." At present, the menu offers three classic pasta dishes and four seasonal choices, plus daily specials. Both of the pastas we ordered were absolute stunners. I had corzetti with mushrooms, a wonderfully woodsy flavor match for the perfectly al dente pasta coins served with a just-buttery-enough sauce offset with fresh herbs. 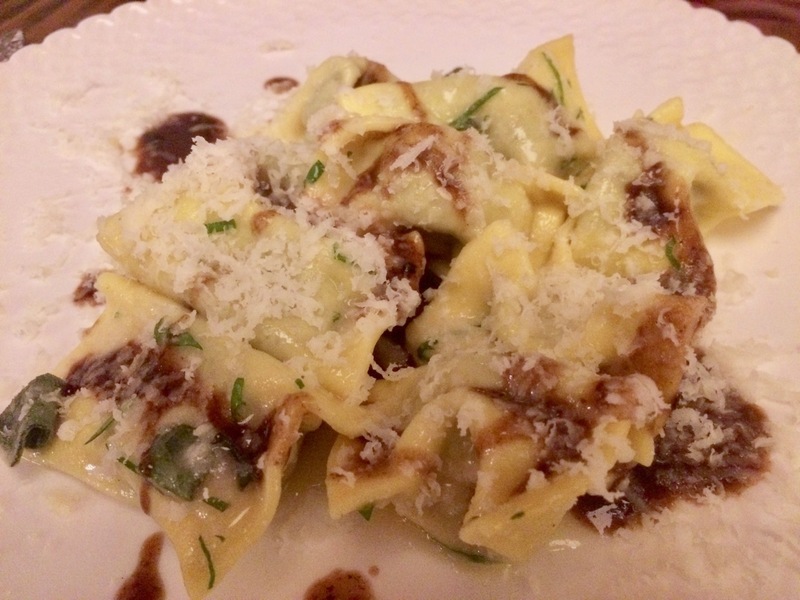 My husband got the meaty Agnolotti del Plin, ravioli-like pasta stuffed with beef short ribs and served with a parmesan and rosemary sauce, a wonderfully wintery pasta. A side of roasted cauliflower was a great way to add some additional vegetables to the meal. Our pastas went down easy with the restaurant's interesting selection of Italian wines, which includes about a dozen by-the-glass options like the bold Tolaini Valdisanti, a blend of cabernet sauvignon, sangiovese and cabernet franc. Want something stronger? There's also a short cocktail menu that includes a sensational "Van Ness" Manhattan made with byrrh quinquina and orange bitters. The run-up to our main course was good, although not nearly as stellar. A salad of arugula, citrus, soft cheese and pomegranate arils is a good way to get some greens into the meal. Sfoglina's house bread, a crisp, crackery affair that arrives in a bag, is more interesting for its story (printed on the bag) than its flavor. Perhaps some spreads would make this initial offering more interesting. 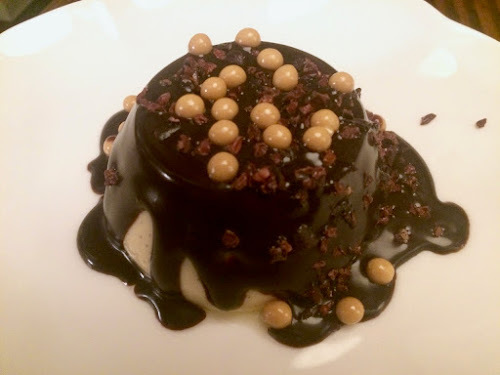 Caramelized vanilla pudding with chocolate provided a satisfying sweet end. Service at Sfoglina was friendly and prompt. There was a bit of unevenness, but I think that's probably because the restaurant hasn't even been open to the public for a week. One of our servers butchered a few descriptions of the menu items and another was kinda pushy with the dessert menu when we'd said we wanted to sit a bit and finish our wine. These are pretty minor issues among a team that's otherwise polite and professional. I love the design of the restaurant, which is warm and cozy. It's a fairly small space--not nearly as expansive as Fiola or Casa Luca--fitting with its status as a neighborhood restaurant. I also really appreciate that it's not nearly as noisy as most new restaurants these days. I'd read that smart design choices help dampen the noise at Sfoglina, which I really appreciate. Sfoglina does face a few challenges, and it will be interesting to see how it handles them. For starters, the restaurant is sort of "out of the way," in comparison to the Trabocchis' other establishments. Van Ness, while on the up-and-up, is not a "hot" food zone like Shaw nor as highly trafficked an area as downtown or Georgetown. Sfoglina is also fairly expensive for the area--priced about the same as Casa Luca--probably about the most expensive restaurant north of Cleveland Park. As well heeled as the neighborhood is, this puts Sfoglina in a category of nearby restaurants we might enjoy for special occasions, but it's too heavy a hit on the wallet for us to warrant becoming regulars. For this reason, I doubt it will actually steal much of the tourist traffic away from Tesoro across the street. Despite these challenges, I have high hopes that Sfoglina will succeed. It's nice to have an option like this in Van Ness, a neighborhood that has long been in need of a top-quality restaurant. 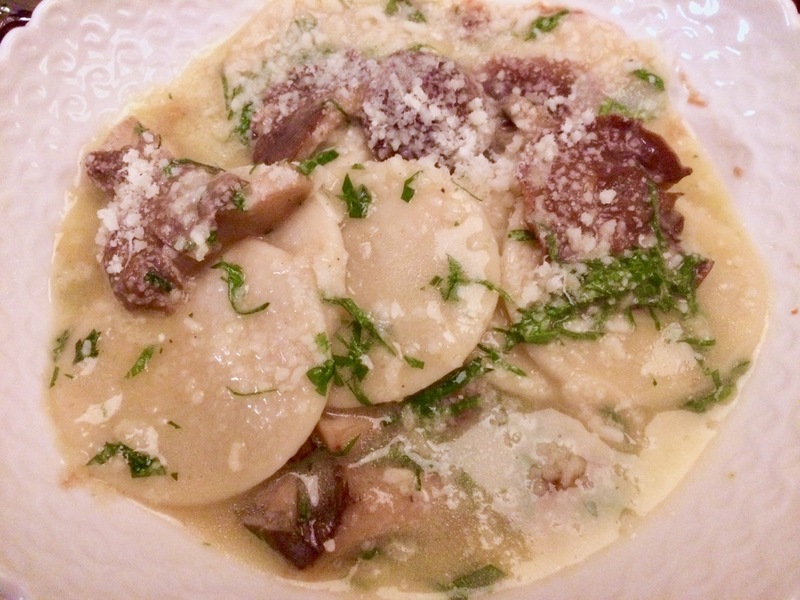 Sfoglina's warm atmosphere and top-shelf pastas are an exciting draw in a corner of the city that's becoming tastier all the time. Sfoglina, 4445 Connecticut Ave NW (In the new Park Ness building). (202) 450-1312. Reservations: Reserve. Where I grew up, I could walk half a mile to the closest main street. However, all it offered were car dealerships, and the sole business of potential interest to foot traffic, a record store, was bulldozed in the mid-80s to make way for...another car dealership. We lived in a nice neighborhood: it just didn't have good commercial amenities we could walk to. I'm very luck that where I live now provides easy access to many amenities within short walking distance, particularly the one-block commercial strip along Connecticut Avenue just south of Nebraska Avenue that's just a few blocks away from me. It's a little too far north to be Van Ness and a little too far south to be Chevy Chase. Although technically it straddles two neighborhoods, I've taken calling it Forest Hills, which is both bigger and better known locally than the other option (Wakefield). The area is home to a CVS, two dry cleaners, three gas stations, a nail salon, a chiropractor, a bank, a liquor store, a kitchen remodeler, a paint store, an art gallery/framing shop, some law offices, a small market/cafe, five full-service restaurants, and the strip's best-known business, Politics & Prose, a popular independent bookstore that survives and thrives in the Amazon era. It's a wonderfully varied collection of mostly independent businesses providing a sort of "small town within the big city" feel for the local inhabitants and any Connecticut Avenue commuters on their way in or out of town. My husband and I have lived nearby for more than 10 years. We eat out in the neighborhood restaurants almost every weekend. I've met Michael Chabon, Elizabeth Strout and countless other famous authors at Politics & Prose. This is our neighborhood and we love it. 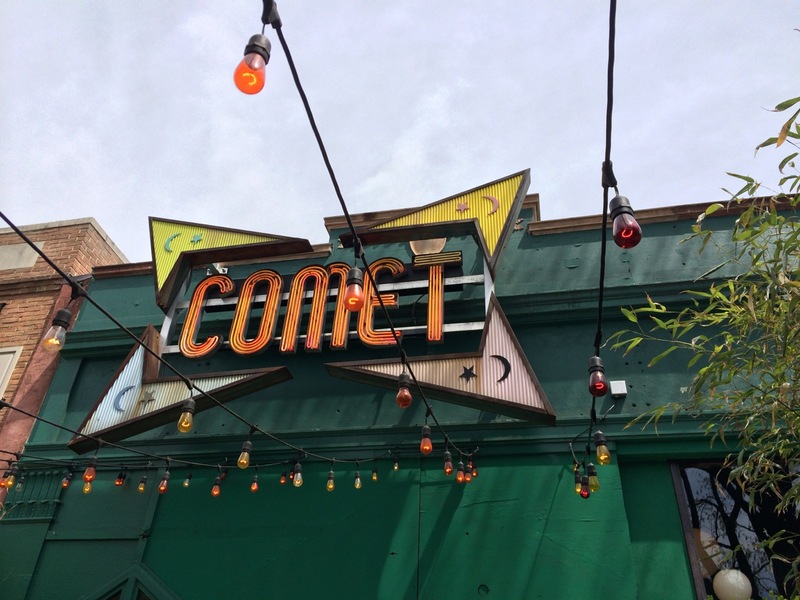 For the past month, the neighborhood's pizza restaurant, Comet Ping Pong, has been the target of a an outlandish conspiracy theory claiming the restaurant is a front for child trafficking and pedophilia. The basis of this is some stolen emails between Hillary Clinton's campaign manager and Comet's owner discussing pizza. Convinced this must be a coded message, conspiracy theorists dove into the social media accounts of the restaurant, its owner and its staff (and their friends), looking for photos to convert into nasty memes and anything else they could use to attack the restaurant. Not content to just attack Comet, they decided the whole neighborhood must be in on it, and spread their attacks to the block's other businesses. Last Sunday, the story evolved from online harassment into something dangerous. As unbelievable as the so-called "pizzagate" story sounds, it was enough to convince Edgar Maddison Welch that children were being held captive in the restaurant. Claiming he intended to free these kids, Welch armed himself and drove 350 miles from his home in Salisbury, North Carolina, to Comet Ping Pong to "self-investigate." That afternoon, we were sitting in Comet Ping Pong ready to enjoy a laid back pizza lunch in our favorite neighborhood pizzeria. We'd ordered our beers--Firestone IPA on tap--and pizza. 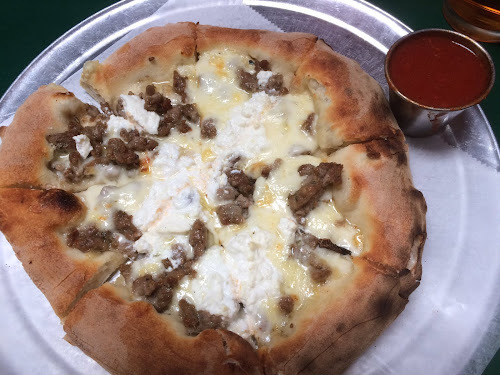 Although I usually get a Stanley (sausage and roasted pepper) or a Jimmy (meatball), that day I decided to try the Momma'zu, a white pizza with sausage, fontina, ricotta and a side of meat sauce. Our beers arrived, but I never even took a sip. A young man (who we later learned was Welch) entered the front of the restaurant and walked quickly through the main dining room, the bar area, and the ping-pong room in the back. He didn't stop or talk anyone. It wouldn't have been so odd except for the fact that he was toting a giant black assault rifle. As he walked by our table, my husband and I looked at each other in surprise. Did that just happen? Was that supposed to happen? Is that a prop for a forthcoming concert? We looked around. It happened so fast that not everyone noticed. A lot of people were happily still eating their pizza. But a few had noticed. And we noticed each other noticing, and so did the staff. And that's when the realization crystallized: We were in danger. A few people got up and then moments later everyone did. We quickly exited the restaurant, followed by the staff. Not wanting to stick around to see if the gunman would come around from the back or out the front to shoot us, we quickly vacated the area. Soon after, the police arrived in droves. Welch, having searched the place and found nothing (of course), surrendered. He'd fired some shots during his search, but thankfully not at any of us customers. We were rattled for the rest of the day, ashamed we hadn't reacted faster, scared of what could have happened (or what might happen next) and angry, intensely angry, that one of our favorite neighborhood hangouts was (and still is) subject to an unending onslaught of baseless defamation. The next day, it all became national news. And we were concerned for Comet. Surely this would hurt business. Would the staff quit? Would Comet close? Would the attackers then turn to the next neighborhood business and continue their assault until it closed too? Then something remarkable happened: the community came together. I wasn't the only one who was angry. Scores of people turned out to support Comet. They left flowers and messages by the restaurant when it was closed Monday. They showed their support online. 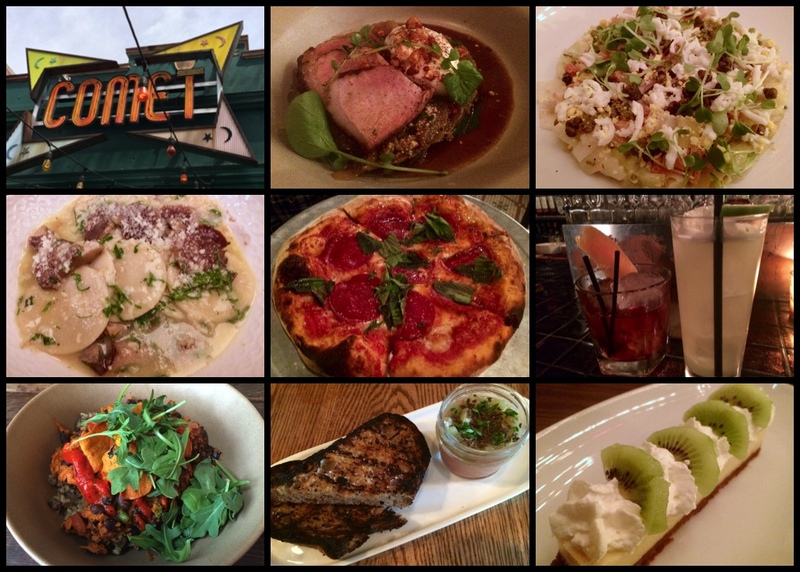 And when Comet reopened Tuesday, they ate pizza. The restaurant has been busy as ever, and during the weekend, a concerted effort to encourage people to visit Comet and the surrounding businesses, known as #StandWithComet, meant Comet was so packed they erected a tent to cover the front porch as a waiting area. It was completely full when we walked to the block around 6:45 on Friday. Yesterday, we went back to Comet. Although it's usually kind of slow on Sunday afternoons, we had to wait 40 minutes for a table. The place was packed! I ordered the same pizza I ordered last Sunday, but didn't get to eat, the Momma'zu, and it was fantastic. We also got two rounds of Firestone IPAs, our usual and favorite tap selection. We talked about TV, our jobs and the amazing response from the community. I thought I might be apprehensive about being in Comet again, but it actually felt totally normal (except for the bigger than usual crowd, but that's a good thing). We've spent so much time in Comet, that we feel right at home there--the only time we haven't felt that way was last weekend when we got chased away. It was nice to have our normal Sunday afternoon back again. Comet Ping Pong Momma'zu pizza: the pizza I ordered last Sunday but didn't get to enjoy until a week later. Delicious! After witnessing the conspiracy theory against Comet and the neighborhood unfold, and having been at Comet when it turned really ugly, it has been nice to see the neighborhood rally behind these businesses with such an outpouring of support. In a time when people can act so bitterly against one another, it made us hopeful to be reminded that they can also be caring. The attacks against our neighborhood businesses aren't just felt by their owners and employees--us residents feel it too, and we're not going to put up with it. Our neighborhood is a special place, and we're going to fight to keep it that way. We #StandWithComet and all the local businesses that contribute to making our neighborhood a great place to live. Want to #StandWithComet too? There are many ways to do so. Of course, the most obvious way is to visit the restaurant and enjoy its great pizza. Don't forget to support the neighborhood's other businesses too: grab a burger at Buck's Fishing and Camping, order a pizza from Besta Pizza, pick up a delicious sandwich from Little Red Fox, take in a warm bowl of Beef Bourguignon from Terasol, or enjoy a pint and a game at Jake's American Grille. And be sure to peruse Politics & Prose afterwards; maybe you'll meet a famous author or find a book you've been meaning to read. There's also a Go Fund Me effort to help Comet defray expenses from the days it was closed and the extra security the restaurant has hired. You can also show your support online, such as on Comet's Facebook page. And finally, importantly, be a critical thinker. There are so many sources for information these days, which means we must evaluate if what we're hearing and reading is sensible, factual and fair. Actions always have consequences and each of us must be responsible for our own actions. 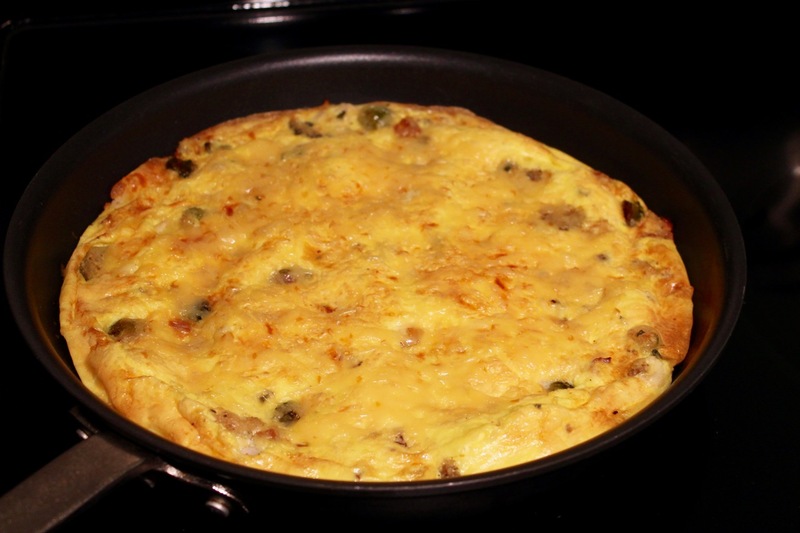 Frittata is a wonderfully forgiving food. There are a lot of things you can throw together and encase with lightly scrambled eggs and some shredded cheese and it's guaranteed to be tasty. I've made frittata with 1) bacon, Brussels sprouts and caramelized onion, 2) sausage, mixed vegetables and gruyere, and 3) sausage and green beans, and each time it was a knockout dish. This is what you call a recipe for success. So why not give it a try with Thanksgiving leftovers? My version incorporates turkey, stuffing, and Brussels sprouts tossed together with some smoked gouda, but surely sweet potatoes, greens, and other vegetables would be delicious prepared this way. Just add eggs and a some cheese. Friday never tasted so good. 1. Preheat oven broiler with rack 4 inches below the broiler. 2. Heat 2 tbsp. olive oil in a 12-inch nonstick oven-safe frying pan over medium heat. 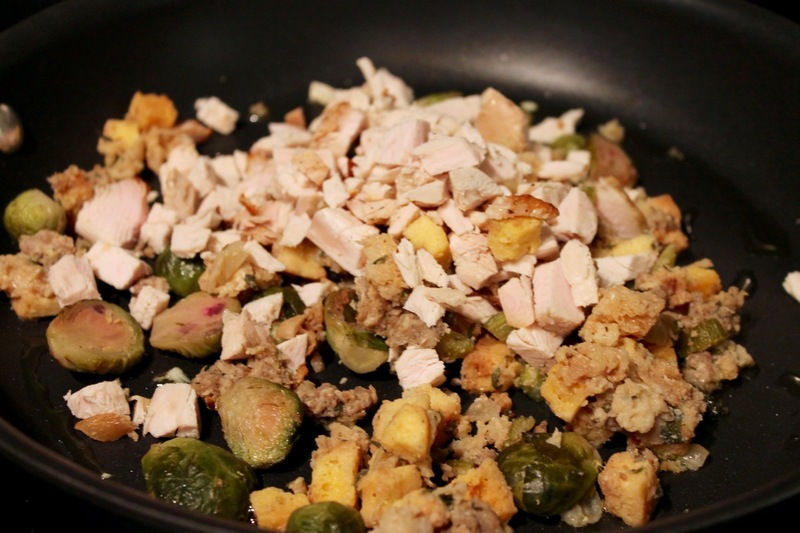 Add the turkey, stuffing and Brussels sprouts and cook, stirring occasionally, until reheated, about 2 minutes. Spread the ingredients evenly in the pan. 3. Whisk together the eggs and half the cheese in a large bowl. Pour the eggs and cheese over the turkey mixture. Continue to cook on the stove to set the bottom of the eggs, about 3 minutes. 4. Transfer pan to the oven and broil until the top is firm, about 3 minutes. Spread the remaining 1/2 cup of cheese on top and broil an additional minute to melt and brown the cheese (watch to make sure it doesn't burn). Remove from oven and cut into wedges for serving. 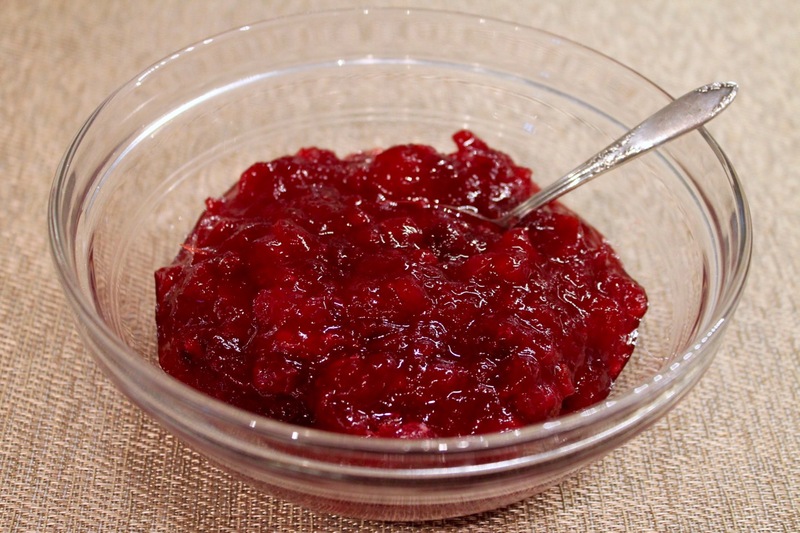 Serve with cranberry sauce. Turkey is the traditional centerpiece of Thanksgiving. And while many people--including me--love a good roast turkey, there are those folks who don't like turkey. For whatever reason, it's just not their thing. They may feel guilted into making turkey anyway, because of the holiday. To those folks I say: be a rebel. Make something else! What's important on Thanksgiving is that make a meal your guests will love. It doesn't have to be all the "traditional" dishes if that's not what you and your crowd is into. Shake things up! 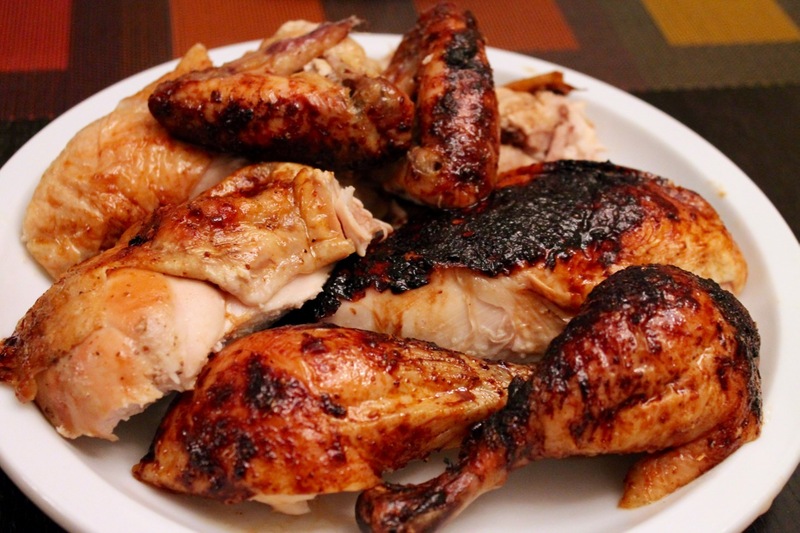 Along those lines, I came up with this Kung Pao-style roast chicken. Before any of you food purists out there get huffy with me, I realize this bears no resemblance to actual Kung Pao Chicken (a dish I adore, by the way). 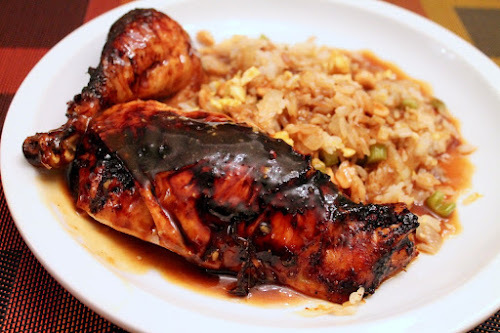 Rather, the flavors of the glaze and, to some extent, the accompanying gravy and fried rice are inspired by the spicy-sweet flavors of a good Kung Pao (those desiring recipes for actual Kung Pao Chicken can look here, here or here). However, the presentation has been modified to be something more akin to Thanksgiving: a whole roasted bird with gravy. 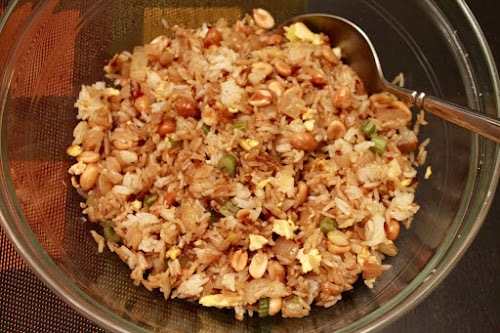 Consider the side of fried rice sort of like the accompanying stuffing, and I hope you'll see how this could be a satisfying alternative to traditional turkey and stuffing. Alternatively, you could just make this anytime for a satisfying dinner. You can this really spicy if you want by amping up the cayenne pepper and red chili pepper flakes. I went for something that gives a gentle undercurrent of heat. Be sure to cook the rice in advance for the fried rice. Note: Please note that this recipe calls for already cooked white rice--plan ahead! Szechuan peppercorns are available from spice stores and Chinese markets. They are not "hot" like a chili pepper but rather create a numbing sensation. Pick through the peppercorns and discard any black seeds that may be present, as well as unopened pods--you only want to use the hulls. The seeds are gritty and don't taste good. 1. Preheat oven to 375 F. Set a V-rack into a roasting pan. Place the chicken, breast-side up, on the rack. Brush the chicken with vegetable oil. Combine ground Szechuan peppercorns, seasoned salt, black pepper, garlic powder and cayenne pepper in a small bowl. Rub the spice mixture all over the chicken. Roast in the oven for 25 minutes. Add 1/4 cup of water to the roasting pan and roast another 15 minutes. 2. Combine the glaze ingredients in a small bowl and whisk until combined. Brush the chicken with glaze and continue roasting the chicken for another 40 to 50 minutes, brushing with glaze every 10 minutes until the chicken is cooked through (an instant-read thermometer stuck into thick portion of the breast or thigh should read at least 165 F). 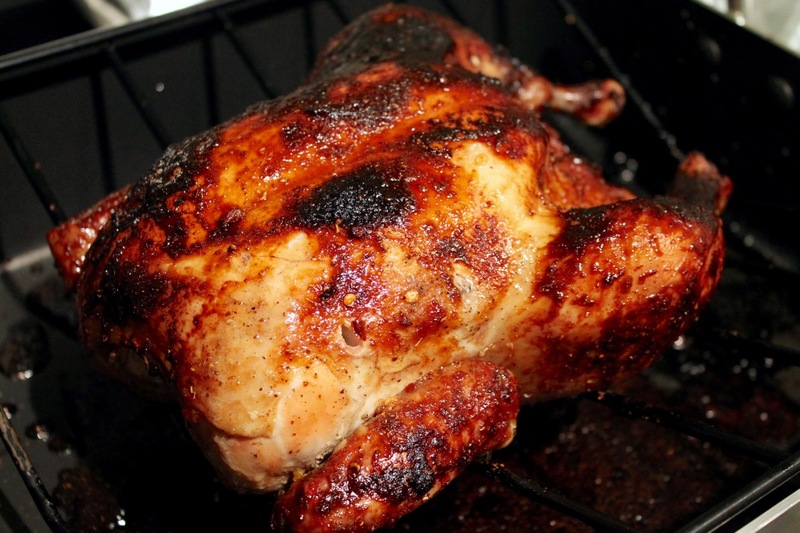 Remove chicken from rack and set aside on a cutting board to cool for about 10 minutes before carving the chicken. 3. Transfer drippings (about 2 tbsp. worth) from chicken roasting pan to a 10-inch nonstick frying pan over medium heat. Add the soy sauce, sherry, vinegar, sugar, sesame oil, garlic cloves, chicken stock, cornstarch and red chili pepper flakes and bring to a boil. Reduce heat to simmer and cook until the gravy has thickened, about 5 to 10 minutes. 4. Make the fried rice (you can do this while the chicken is roasting): Heat a large nonstick skillet over medium-high heat. Add the rice and 1 tbsp. of vegetable oil and sauté until the rice is lightly golden and chewy, about 5 minutes. Remove the rice from the pan. Add the remaining vegetable oil and, when hot, add the onion and celery and sauté until softened, about 5 minutes. Return the fried rice to the pan and add the soy sauce, sesame oil and peanuts. Stir to combine, then push the ingredients to the sides leaving a 4-inch dry circle in the middle of the pan. Add the egg to the circle, and stir to scramble, then combine with other ingredients. 5. Serve the chicken carved with the fried rice an gravy on the side. Some prefer apple. Others go for pecan. A few brave the world of "mincemeat." 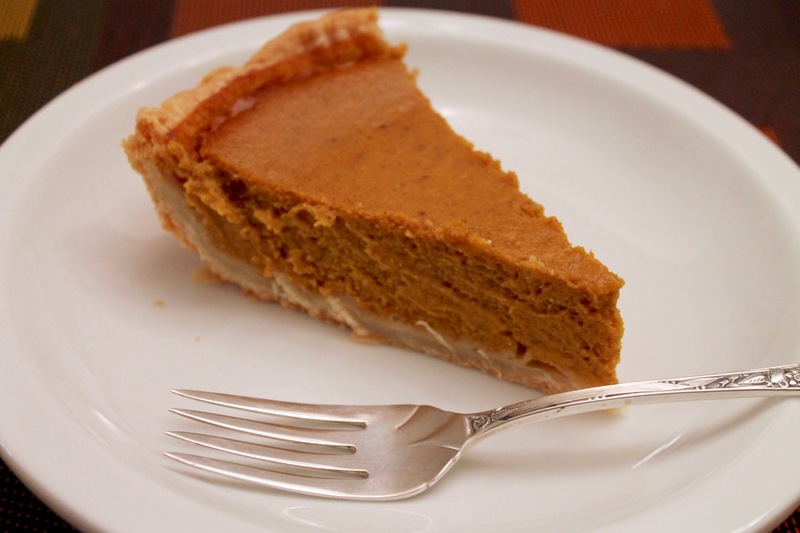 But few can deny that pumpkin is the most traditional flavor of pie to serve for Thanksgiving. Pumpkin is easy to acquire. Just buy a can of Libby's pumpkin puree and call it a day. Or....shake things up. 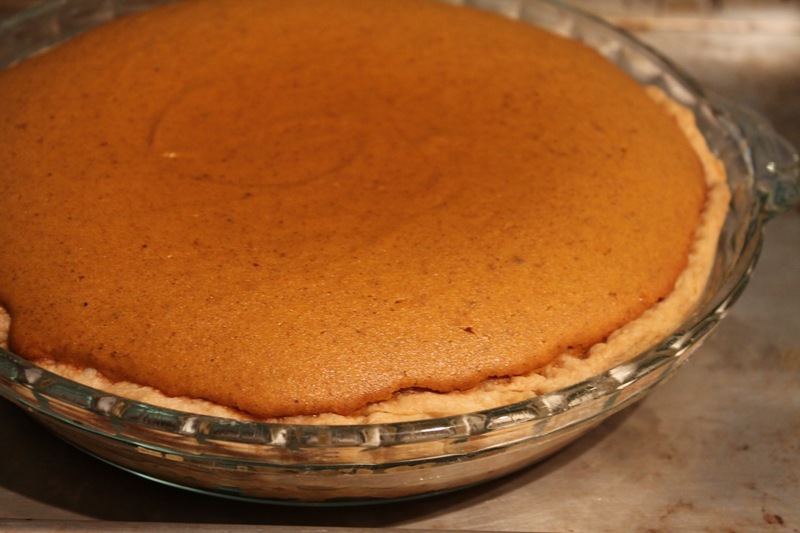 Ditch the can and make a better pumpkin pie by not using pumpkin at all. Instead, make "pumpkin" pie with butternut squash. After all, I've ready that Libby's pumpkin isn't really pumpkin anyway but Dickinson squash--although Libby's will call it Dickinson pumpkin, and I might point out that "pumpkin" is a sort of generic term anyway, rather than a name for specific type of squash. So, it's all good (Snopes even looked into this). However, it's even better if you use butternut squash, which is, after all, my favorite squash, and I suspect it might be yours as well (it's really good). Just roast the squash first and puree it, making sure you have enough for 1 3/4 cups, which is about the amount you'd get in a 15 oz. can. And since booze and dessert go so well together, this recipe also calls for some brandy. Cheers to that! Just who came up with this wonderful variation on the Thanksgiving pie? Melissa Clark, the New York Times recipe writer who, at this point, I think is safe to say is the goddess of all things delicious. Seriously, I've never met a Melissa Clark recipe that wasn't incredibly good (her garlicky chicken thighs and pinto bean soup recipes are among my favorites). 1. Make the crust: add the flour and salt to the bowl of a food processor and pulse to combine. Add the butter and pulse into the mixture forms pea-size pieces. Add ice water in 1-tbsp. increments, pulsing after each addition, until the dough just comes together (you may not use all the water). The dough should be moist but not wet. Place the dough on a lightly floured surface and form into a ball, then flatten it into a large disc. Wrap the dough with plastic wrap and refrigerate it for at least 1 hour, up to 2 days. 2. Make butternut squash purée: Preheat oven to 400 F. Peel and halve the squash and remove and discard its seeds (pro tip: an ice cream scoop works great for removing squash seeds and slimy membranes). Cut the squash into 1 1/2-inch pieces and place them in a large bowl. Pour the melted butter over the squash and toss to coat. Transfer the buttered squash cube to a baking sheet and roast, stirring every 15 minutes, until the squash is tender, about 30 to 45 minutes. Remove from oven and cool, then puree in a food processor. 3. Lightly flour a work surface. Place the chilled dough disc in the center and roll out to a 12-inch circle. Transfer the crust to a 9-inch pie plate. 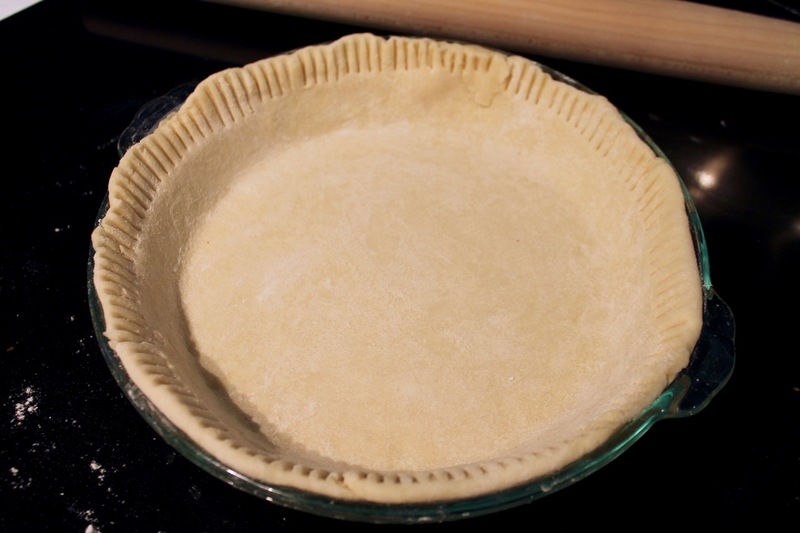 Fold the edges of the dough under so the dough comes up to the top of the pie plate (see photo above). Crimp the edges with fork tines and prick it the dough all over with the fork. 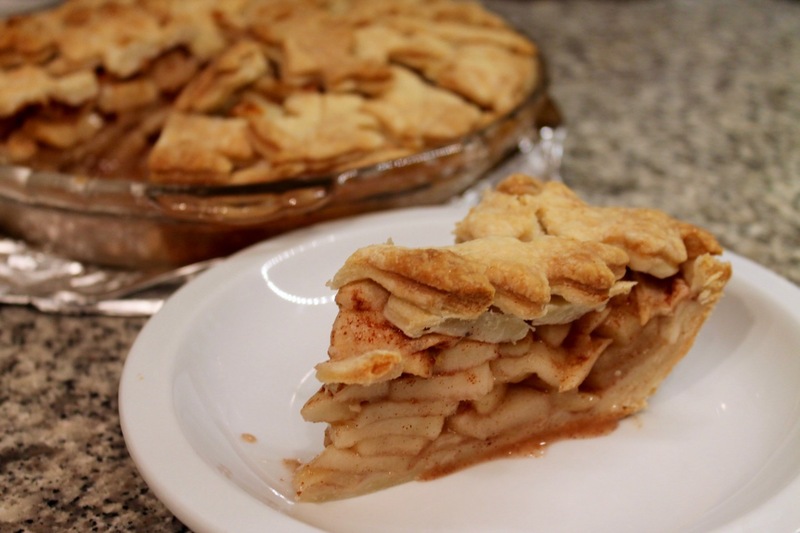 Place the pie plate in the refrigerator to chill the crust for 30 minutes (don't skip this step--the dough needs to be cold when it goes in the oven to minimize shrinkage). 4. Heat the oven to 375 F. Line the top of the chilled crust with aluminum foil and weight it down with pie weights (you can also use coins or dried beans). Bake the pie crust for 20 minutes, remove the foil and weights and bake an additional 5 to 7 minutes until the crust is lightly golden. Remove from the oven and set on a rack to cool a bit. 5. Lower oven temperature to 325 F. To the bowl of a food processor, add the squash purée, eggs, cream, dark brown sugar, brandy, ginger, cinnamon, 1/2 teaspoon salt, nutmeg and clove. Turn on the food processor and blend until the mixture is smooth. Pour squash mixture into the cooled pie shell. Set the pie plate on a baking sheet and place in the oven. Bake until the crust is golden and the filling jiggles just a bit in the middle when shaken, about 50 to 75 minutes (Clark says to bake the pie 50 to 60 minutes; I recommend using an instant-read thermometer and cooking the pie until the filling registers 165 F). Remove the pie from the oven and cool before serving. 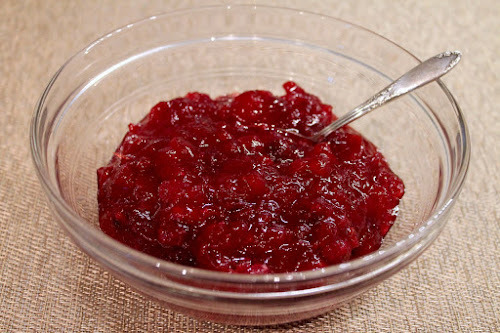 Probably the best cranberry sauce we've had at Thanksgiving. "Tastes like summer," said Chris. 1. 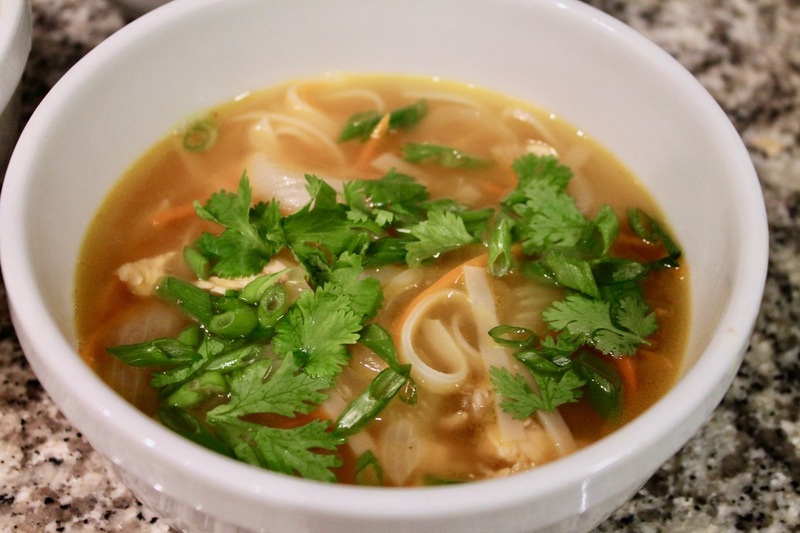 Combine all of the ingredients in a heavy saucepan. Cook over medium heat until the berries pop open, about 10-14 minutes. Smash the berries around a bit with a spoon as they cook so some break up. 2. Using a spoon, skim any foam off the top surface of the sauce and discard the foam. Cool the sauce to room temperature, then refrigerate, covered, for up to 3 months. Every good Thanksgiving spread needs some good vegetables sides. 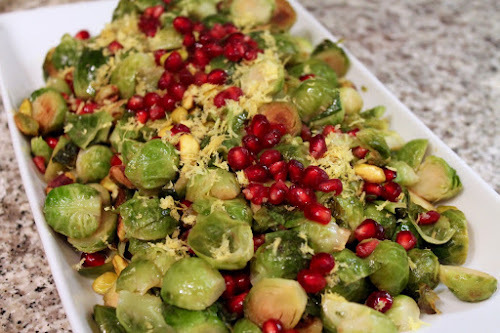 And not vegetable sides loaded with so much butter and sugar that they are pretty much a dessert, but honest-to-goodness recipes that honor the vegetables at the core of the dishes. That's what I'm aiming for here, a sweet potato side with no added sugar and no butter: just an assist from celery and the flavorful mix of garlic, rosemary and cumin. 2. 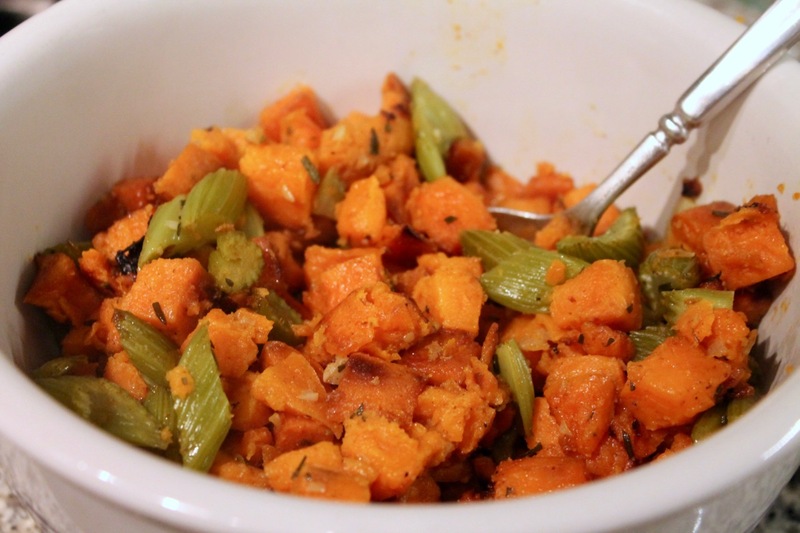 Combine sweet potato cubes with 2 tbsp. olive oil, season with 2 tsp. cumin, salt and pepper in a large bowl and stir to coat potatoes with oil and seasoning. Transfer potatoes to a roasting pan and roast for 20 minutes. 3. Combine the celery with the remaining tbsp. of olive oil, tsp. of cumin, salt and pepper in a large bowl and toss to coat the celery with oil and seasonings. Remove the roasting pan with the potatoes from the oven and stir in the seasoned celery, along with the garlic and rosemary. Return the roasting pan to the and roast another 20-30 minutes until the vegetables are tender and lightly browned. Serve in a large bowl. 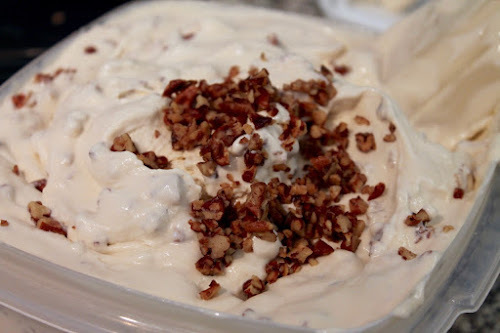 This ice cream pretty much stole the show when I made this for Thanksgiving last year. It is really really good. 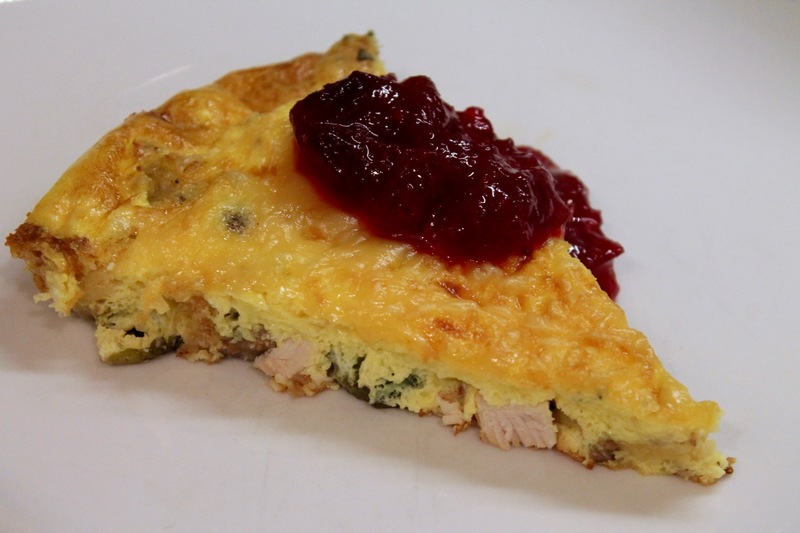 Note that the recipe calls for whole eggs rather than the usual egg yolks. Worked totally fine that way. 2. Spread pecans on a baking sheet (lined with foil for easy cleanup) and toast in the oven until fragrant and slightly darker, about 7 to 8 minutes (watch the nuts to avoid burning them). Remove nuts from oven, transfer to a bowl (they will be hot). Add butter and salt to hot pecans and toss until butter is melted, then set nuts aside to cool completely. 3. Stir together the brown sugar and cornstarch, then add the eggs and stir until combined (you can try using a whisk for this, since the original recipe says to "whisky" but I think using a spoon or spatula will work much better, as the whisk tends to fling ingredients too easily). Bring milk and cream just to a boil in a 3- to 4-quart heavy saucepan over moderately high heat, (reduce heat to medium-low) then add to egg mixture in a stream, whisking constantly, and transfer custard to saucepan. (rather than add the hot milk to the bowl and transfer back to the pan, I just added the egg mixture to the pan while whisking constantly). Cook custard over moderately low heat, stirring constantly with a wooden spoon, until thick enough to coat back of spoon and registers 170 to 175°F on an instant-read thermometer, 2 to 3 minutes (do not let boil). Immediately pour custard through a fine-mesh sieve into a bowl and stir in vanilla, then cool, stirring occasionally. Chill custard, its surface covered with wax paper, until cold, at least 3 hours. Freeze custard in ice cream maker until almost firm. Stir together ice cream and pecans in a bowl, then transfer to an airtight container and put in freezer to harden. 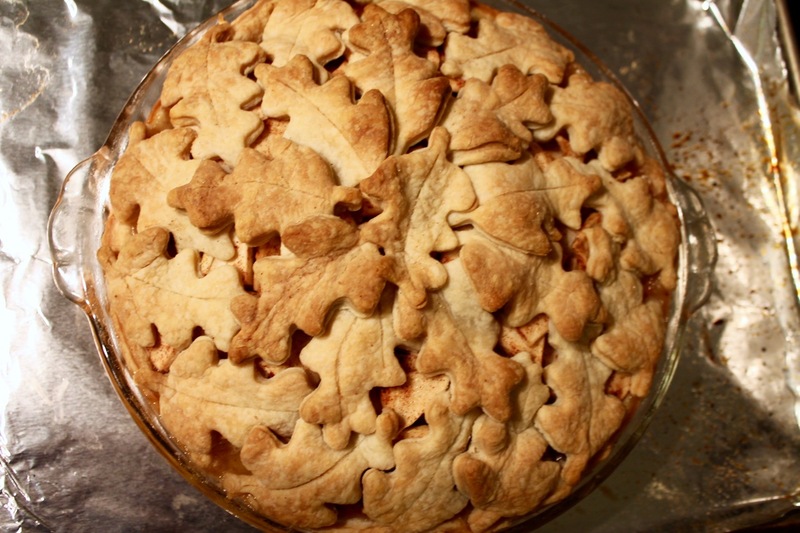 I've covered apple pies with a plain crust and a lattice, but for this pie I wanted to get more decorative. I've seen pies decorated with cutouts and the idea in Fine Cooking magazine to use overlapping leaves seemed perfect for Thanksgiving, everybody's favorite fall holiday. The Fine Cooking recipe calls for cutting each leaf by hand, as well as making smaller leaves. I cheated a little bit: I used a leaf-shaped cookie cutter. This worked great, as each leave was the same size--about 3 1/2 inches long by 2 inches wide. I scored a line down the middle of each leaf with sharp knife (do this carefully to prevent cutting all the way through the dough). When placing the leaves on top of the pie, they should overlap just slightly. If your leaves are cut to the same size as mine, you'll need 24 leaves to complete the top. 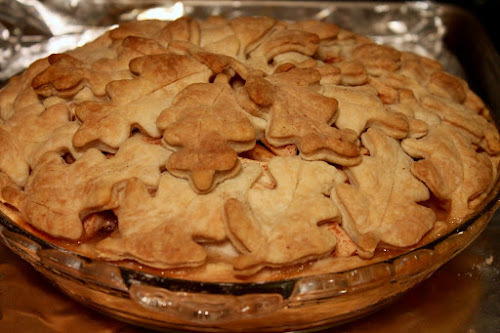 Start with the outer ring and place 14 leaves flush against the edge of the pie plate. Then, complete the inner ring with 9 leaves. Finish with a final leaf in the center. Since I've had such good luck with it in the past, I switched up the crust recipe and used my trusty "foolproof" double-pie crust with vodka recipe from America's Test Kitchen. 3. To make the pie crust and decorative top: On a lightly floured surface, roll one of the dough discs into a 12-inch round 1/8 inch thick. Fold the dough over the rolling pin, ease it into a 9-inch pie pan, and unfold it so it's centered over the pie plate with edges draped over the sides. Press the dough up the sides and over the rim of the pan, and trim it to leave about an inch of dough beyond the rim of the plate. Fold the edge of the dough under itself so that the crease is flush with the top of the pie plate. Press a fork into the edge of the dough to make vertical lines--this "crimping" process seals the folded dough together. Chill the pie plate with the dough while you cut out the leaves. 4. Combine any scraps from the first disc with the second disc and roll out the dough to 1/8 inch thick. With a paring knife or a leaf cutter, cut out at least 24 leaves 3 1/2 x 2 inches in size. With the paring knife, score a "vein" down the center of each leaf, being careful not to cut all the way through the dough. 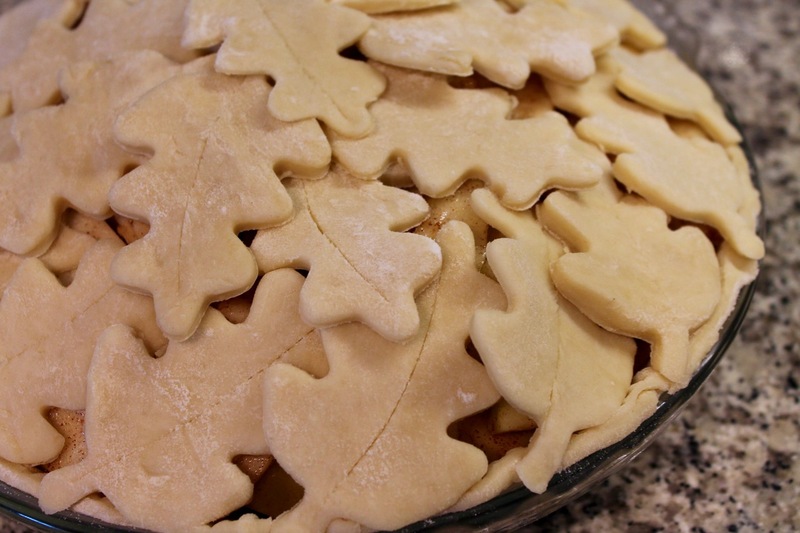 Place the cut leaves on a floured baking sheet (don't stack them) and set them aside in a cool place. 5. 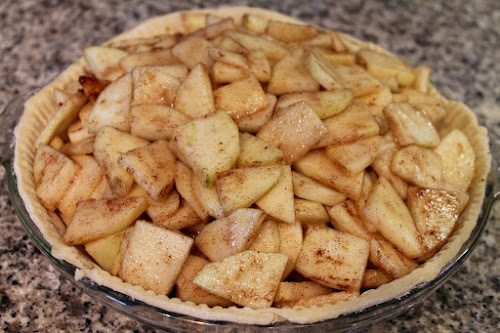 Cut the apples into 1/4-inch slices--there should be about 7 cups. Put the apples in a large bowl and add the sugar, flour, cinnamon, nutmeg, and salt. Toss gently to coat the apples with the flour-sugar-spice mixture. Transfer the apples to the cooled pie shell, tucking in any apples to create a slight dome in the center. Dot the apples with large flecks of the remaining 1 to 2 tbsp. of butter. 6. 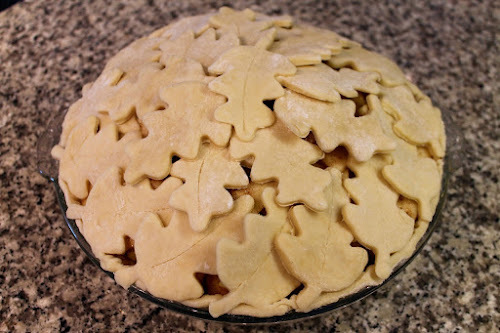 Starting at the rim of the pie plate, place the leaves at a slight angle and slightly overlapping around the edge of the pie until the leaves go all the way around. Then make a second smaller circle of leaves closer to the middle of the pie--finishing with a final leaf in the middle. Chill the pie in the refrigerator for 15 minutes. 7. Position two racks close together in the lower third of the oven, set a foil-lined baking sheet on the lowest rack to catch any drippings from the pie. Heat the oven to 350 F.
8. Bake the pie on the second-lowest rack until the crust is a deep golden brown all over and the apples are tender when pierced with a thin knife blade, about 60 to 80 minutes (I baked my pie for 85 minutes). Let the pie cool completely before serving.